JT Eaton 207-W Water Based Bed Bug Spray - 1 Qt. Hi, I’m Nicole with JT Eaton. As the bed bug epidemic continues to spread throughout the US, there are several new tools available to help prevent and control infestations. One of these tools is a lockup, premium comfort encasement for your mattress, box spring, and pillow. JT Eaton manufactures the highest quality encasements. Our soft, terry cloth top mattress encasement is waterproof, dust mite- proof, hypoallergenic, and most importantly, bedbug-proof. Protect the investment of a mattress before you have an infestation. Bed bugs cannot penetrate the encasement to reach your mattress. If you do find evidence of bedbug activity, simply remove the encasement and run it through your washer and dryer. Has your mattress been exposed to bedbugs already? Don’t throw out your thousand dollar investment. Use our lockup premium comfort encasements; anything missed by a chemical treatment will be locked up, preventing bedbugs from biting you again. 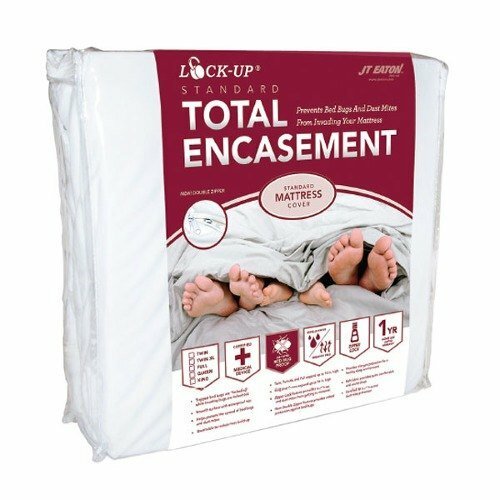 Don’t forget to lockup your box spring in a premium comfort encasement. Our box spring encasements have double reinforced corners to prevent rips and snagging. Protect your pillows with our velvet pillow encasements. They are waterproof, dust mite-proof, hypoallergenic, and bedbug-proof for a safe, sound sleep. JT Eaton also has tough, stainless steel lockup bedbug barriers to complement the lockup encasement line. These barriers help monitor the progress of a bedbug control program and can be used with any legged furniture. There is also a coupon inside for three dollars off towards a lockup encasement purchase. 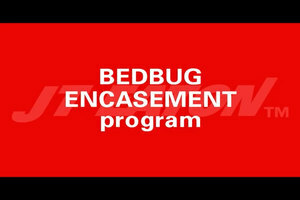 For more information on bedbugs, including prep sheets, charts, diagrams, other videos, and step-by-step instructions on how to eradicate bedbug infestations, go to www.JTEaton.com/bedbugs. Watch this video to learn how to fight the rising bedbug epidemic! See how mattress, box spring, and pillow encasements all work to protect your bedding investments. Act proactively and ensure a night of peaceful sleep. Bed bug infestations are becoming increasingly common in homes. This year's National Pest Management Association's Bugs Without Border survey found that 99.6% of pest professionals have treated bed bugs in the past year. This is up compared to 5, 10, and 15 years ago. If you fall prey to bed bugs, it's important that you identify and locate bed bugs and then use the right tools to eliminate them. Professional pest control operators use integrated pest management, IPM, techniques to eliminate bed bug infestations. IPM is an effective combination of pest control practices where professionals take advantage of multiple treatment options and use a series of treatment solutions. 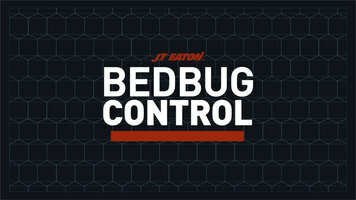 Now you can practice IPM with JT Eaton Kills Bed Bugs complete line of bed bug control products. Step 1, inspect. To eliminate a bed bug infestation, you need to know what bed bugs look like and where they are hiding. Do a close inspection of your room and closet. Look carefully at the sheets, mattress, box spring, and bed frame for signs of bed bugs, like tiny, brown spots, small, dried blood stains, transparent or white egg clusters, and light brown bed bug skin castings. Be sure to also inspect the carpet edges, baseboards, dressers, nightstands, drawers, outlets, and nearby furniture. Step 2, high heat. Remove all your bed linens, pillows, clothing, curtains, and drapes. Be sure to wash and dry on high heat or dry clean those items. Use a high heat setting for at least 20 minutes and the heat will kill off any bed bugs or eggs. Step 3, declutter. Make sure the rest of the room is free of clutter. To do a complete and thorough job, you will have to treat everything in the room where bed bugs can hide: bed frames and headboards, dressers and nightstands, drawers, and even wall hangings. Step 4, vacuum. Vacuum everywhere you can in the room, hitting mattress edges and box springs, crevices, molding joints and corners. After you vacuum, make sure to empty your vacuum cleaner into a plastic garbage bag and seal it up before throwing it away so bed bugs don't get loose and come crawling back. Step 5, knock down. Treat all the joints and crevices where bed bugs may be hiding with Kills Bed Bugs, red label or Kills Bed Bugs Plus, black label. The red label is a powerful, oil-based treatment that quickly kills bed bugs. This product is a contact killer and has no residuals. The black label is a powerful, water-based aerosol spray that quickly kills bed bugs with 12-week residual protection. Use these in areas where bed bugs are seen or likely to be hiding. Begin with the bed and the bedroom furniture. Completely disassemble the bed and all the dressers, nightstands, etc. Treat the entire area around your bed and all the places you have vacuumed including mattress seams, creases, folds, toughs, and foam inside the box spring. To avoid electrical shock, never spray the liquids into or around electrical outlets. Step 6, powder. Before reassembling the bed frame and dressers, dust the joints and crevices with Kills Bed Bugs and crawling insects powder, green label, which provides a long-term, residual killing to prevent reinfestations. Reassemble all the furniture after the treatment. Use the green label powder in outlets or in areas where the danger of electrical shock may occur. Step 7, lock-up. Before replacing the box spring and mattress, treat and seal these items and your pillows with lock-up encasement covers to keep out future infestations of bed bugs and to lock up any missed bed bugs or their eggs. Leave the encasements on for up to a year because bed bugs can live for months without eating. Step 8, follow up. As soon as the bed bug activity subsides, professional pest control operators follow up with additional IPM treatments. Kills Bed Bugs II, blue label, or Kills Bed Bugs Plus, black label, offer long-term control and help prevent reinfestations. All of the JT Eaton products can be applied to crevices, cracks in the floor, baseboard or wall joints, and openings for heating pipes to keep bed bugs from coming back into the room. Even with professional applicators, more than one treatment is usually required to completely eradicate bed bugs. Therefore, monitor the infested areas daily and maintain an ongoing IPM control program. Reapply blue label, black label, or green label products if there are indications that additional bed bugs are present. These products do not kill instantly, but offer longer-term control for bed bugs and will eliminate your infestation problem. Since 1932, JT Eaton has been serving consumers and industry professionals as the leader in innovative and quality pest control products. Check out our website at www.jteaton.com for a full line of pest control solutions. Always read pesticide labels before using and only use in accordance with the label directions. Prevent bed bug infiltration with this JT Eaton 83TWXLE standard twin XL-sized mattress cover! With its Double Zipper feature, the encasement allows you to trap bed bugs already in your mattress and keep them locked inside, while simultaneously locking out bed bugs introduced after you apply the cover. With a soft polyester surface, the encasement is made of resilient stretch-knit fabric which is breathable and comfortable, allowing your guests the best night's sleep possible. This polyester top is also waterproof, protecting against any mishaps or spills. The cover also offers allergen and dust mite protection, especially appealing to those guests who suffer from various allergies. Machine washable, the mattress cover comes with a one year warranty. I got these for our new split king mattress. Mattresses aren’t cheap by any means, so it’s good to protect your investment. It’s great that it protects against pests, but also to help reduce allergens and it’s waterproof so it can protect from spills (I’m always doing breakfast in bed). If you're running any type of lodging facility, I do suggest looking into these mattress covers. They will save you a fortune in the event you get exposed to the dreaded bed bugs. They fit as advertised and are definitely doing their job!